If you’ve spent even five minutes on my blog, you know that I love reading. As a former doctoral candidate in the social sciences, you can also assume that I have a deep love of surveys and data too. I first read this amazing survey on Lindsey Mead’s blog. It was originally created by Jamie of the blog, The Perpetual Pageturner. I loved Lindsey’s answers — and felt like I got to know her a bit better. When I was an English teacher, I spent a lot of time talking about my own reading tastes and habits. I would discuss my present favorite authors and the ones that I loved when I was in middle school. I would talk about where I read and why. I would explain that I sometimes abandoned books that I didn’t like and how I search out books by authors that I liked in the past. I hoped that my students would understand how I integrated reading into my daily life, and, even, into my own identity so that they could think about their own likes, dislikes, and habits. For a teacher, this survey would be a terrific starting point to opening up discussions about reading in a class. For the rest of us, it’s just a great way to learn about new books and about other people. Author you’ve read the most books from: Maybe Anne Tyler. I’ve read all of her novels, some of them many times. Best Sequel Ever: I loved “Emily, Alone: A Novel“ by Stewart O’Nan. 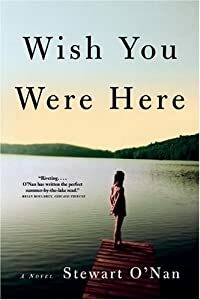 I adored his “Wish You Were Here: A Novel,” admittedly in some ways because of my memories of summers on another lake in upstate New York. Drink of Choice While Reading: Since I read mostly at night, I usually drink water. Yes, very boring, but it’s what I keep on my nightstand. E-reader or Physical Book? For fiction, I can do both. I have a Kindle and a Nook, and I’ve gotten used to reading on them. I can’t read nonfiction on an e-reader. I like to take notes, highlight, etc. and do too much flipping around when I read nonfiction. Fictional Character You Probably Would Have Actually Dated In High School: Honestly, I went to an all girls boarding school so I wouldn’t have been dating anyone. Glad You Gave This Book A Chance: I hadn’t read much Joan Didion. She always intimidated me. But I’m so glad I read “The Year of Magical Thinking.” So profound, so beautiful. It became my guidebook to grief when my father died. Hidden Gem Book: “Use Me “by Elissa Schappel. It’s a novel in ten stories, and I have probably re-read it at least five times. It’s about friendship, family, grief, and (most of all) motherhood. I love her essays, and I read her columns in the Boston Globe. But she’s an amazing fiction writer too. I also loved her “Blueprints for Building Better Girls.” It’s another book of linked stories, tracing the lives of girls from the 1970s on. Important Moment in your Reading Life: When I discovered the joy of ordering books from the library online. This was revolutionary to me. Now my reading habits would not be dictated by my budget or by what my library happened to carry each month. Kinds of Books You Won’t Read: I don’t really traditional romances, although I do like some “chick-lit” romances. I don’t read much sci-fi or too many mysteries. Longest Book You’ve Read: I honestly have no idea. That sounds like a copout, but in my adult life, I don’t read many really long books. Major book hangover because of: I don’t think I get those. Number of Bookcases You Own: A couple in the basement. A few built-in book cases in the living room. Another couple in my office. Preferred Place To Read: On the couch or in my bed. Reading Regret: I wish that I had kept up with more children’s literature and YA books since I stopped teaching. I feel very disconnected from what’s new and great. Series You Started And Need To Finish (all books are out in series): I haven’t finished either the Harry Potter series or the Hunger Games trilogy. Unapologetic Fangirl For: David Sedaris. He’s coming to Buffalo in the next few weeks. I desperately want to hear him read live. Very Excited For This Release More Than All The Others: Strangely, I’m a big fan of the post-apololypse (“The Road” by Cormac McCarthy) or even zombie genre (“World War Z”). I cannot wait until the third book (“City of Mirrors”) in “The Passage” series by Justin Cronin comes out next year. Justin Cronin, who was first an award-winning literary fiction writer, can combine frightening yet moving storytelling with beautiful sentences and paragraphs. Worst Bookish Habit: Letting my reading interfere with getting a good night’s rest. X Marks The Spot: Start at the top left of your shelf and pick the 27th book: “Bossy Pants” by Tiny Fey. ZZZ-snatcher book (last book that kept you up WAY late): “The Silent Wife: A Novel ” by A.S.A. Harrison was very suspenseful! I’d love to hear your responses to any of these questions! I love this post- loved reading Lindsey’s, too. You’re right, it IS a great way to learn about books, and about the people who read them. I’m going to check out your Joan Didion recommendation. I am SO doing this survey! I love this. And I finally just figured out the questions are alphabetically organized. 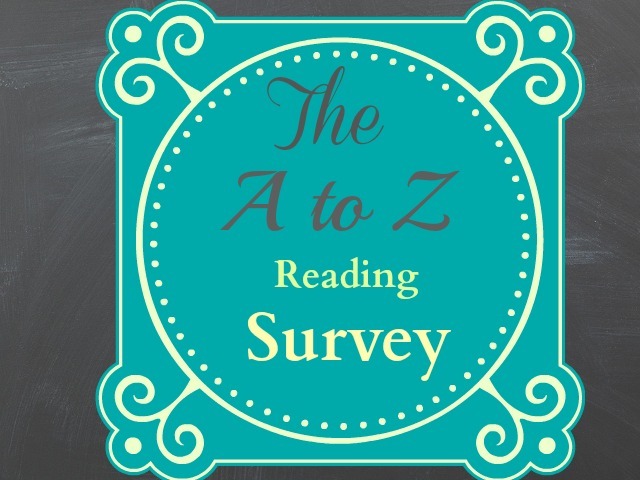 Hence the A to Z survey. duh. I loved reading this but must. stay. away. from. amazon. YES David Sedaris! I love love love him. Huge. Huge huge. Jessica, my very IRL BFF went to Wesleyan after we were at Mills together, I need to PM you her name to see if you know her! My favorite book of all time is The God of Small Things. She only wrote one novel, ever. Said that she told her story and that was it. It’s amazing. Powerful. Brilliant and that’s how I want to write. I’ve read almost every new thing, ever. Have you read Room? It’s awesome. I’m going to check out the Stuart O’Nan books now. Loved this post! Oh I have no idea why I let my passion of reading go. I hardly ever read a book from start to finish within a few months span…and by then the book has lost its luster.